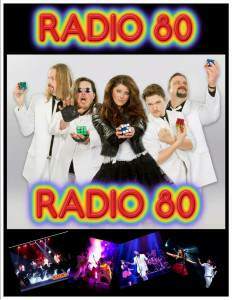 Radio 80 has quickly become the go to 80’s band for Clubs, Casino’s and Special events. The high energy performance from Radio 80 has put them in several High profile events including The Washington State Fair 2 years in a row and many 12’s Fan Fest events. In the past 4 years they have had the opportunity to play with members of Flock of Seagulls, and be the headlining act after many 80’s concerts across Washington State. The song selection is more than just New Wave or Rock, it is Radio from the 80’s! This combined with an energetic frontline of singers and performers makes them a favorite in every situation they play.